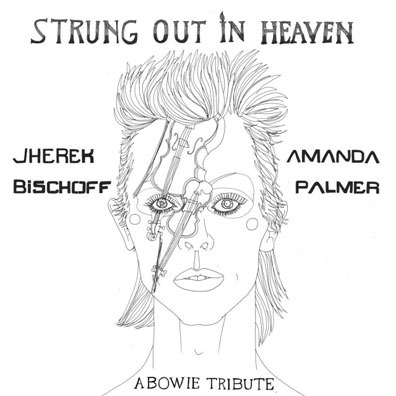 Amanda Palmer and Jherek Bischoff have teamed up to release an EP of David Bowie covers entitled Strung Out In Heaven: A Bowie String Quartet Tribute. The EP features covers of six Bowie songs and also includes contributions from Anna Calvi, John Cameron Mitchell, and author Neil Gaiman (Palmer's husband). It will be released tomorrow via Bandcamp for $1. For the first month some of the proceeds from the EP will be donated to the cancer research wing of the Tufts Medical Center in memory of Bowie (any proceeds that don't need to go to Bowie's publishers). Below you can stream their version of "Blackstar," which features Calvi on vocals and guitar. Or you can stream the whole EP over at Pitchfork. Palmer commented on the EP to Pitchfork, relating how she found out about Bowie's death. "We found out he'd died - by text from Neil's daughter - at 3 a.m. in Santa Fe. We were visiting family, to introduce them to the newborn lying in bed beside us. A tiny fleshy reminder that Bowie, like our other friends, mentors, and heroes who've been consumed by cancer in the past few months, was just...passing through. The baby is Ash. Dust to dust. Funk to Funky." The project was funded by Palmer's Patreon supporters: "The next day I was on the phone to Jherek, discussing another project and I was feeling a bit trapped in the non-productive new-mother cave, so we joked that we should do a flash Bowie tribute. And suddenly, we weren't joking. I had funding from my 7,000 fans on Patreon to 'make stuff.' What better 'stuff?' We started that night, giving ourselves a deadline of two weeks to release it as a surprise." As Palmer points out, Mitchell recorded the German and English for "Heroes"/"Helden" on his iPhone in his New York apartment and Calvi booked a studio in London on three days' notice. Read Palmer's full statement over at Pitchfork. As we previously reported, Bowie passed away in January after an 18-month battle with cancer. His death came as something of a shock, as his cancer diagnosis was not made public and only two days before his death he released a new album, Blackstar (styled as ★). Am I the only one who thinks at least the BlackStar track is gawdawful, unlistenable? Why is someone recording footage on an iPhone? WTF?